The Mow Joe MJ407E is a powerful corded electric lawn mower designed for ease of use and no maintenance. An impressive 12-amp motor powers this mower to tackle tougher grass. The MJ407E has seven different cutting heights for a custom tailored cut. 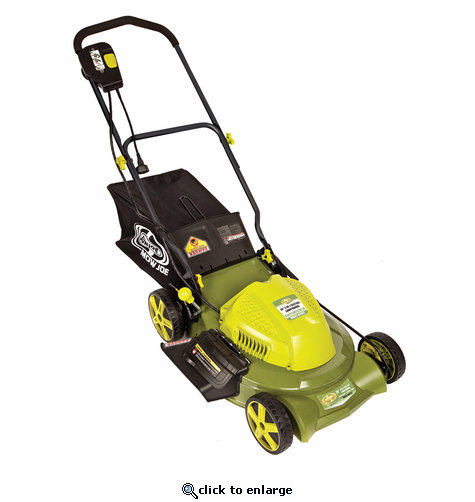 The 20-inch wide 3-IN-1 lawn mower has a rear bag, mulching blade and side discharge chute. The bag is made of a light-weight mesh designed to easily collect grass clippings and detach easily for disposal. The Mow Joe MJ407E is light weight, easy to maneuver, with instant start and redundant safety features. The deck is made of metal for endurance and longevity. No gas, no oil, or tune-ups, perfect for lawns up to a quarter acre. Cutting Height:1.75 in. to 3.75 in.